I know you've seen Little Luxuries featured here on Sweet Stella's before, but not like this. Designer Angela Donaldson has been buckling down and creating so many beautiful handmade accessories for both mom and baby, as well as focusing on photography props, lately. Angela has transitioned and grown with her shop, Little Luxuries, and it has been a really beautiful thing to witness. She recently did a photo shoot with Lainie Hird Photography, and the results were magcial! 100% handmade, and incredibly adorable! Rompers, headbands, and more for little girls. Infinity scarves, brooches and hair accessories for mom. Everything has a bit of a vintage vibe to it, and Angela loves to use lots of lace and burlap in her designs. Incorporate some natural feathers, hand strung beads and hand sewn details, and it's a match made in heaven. 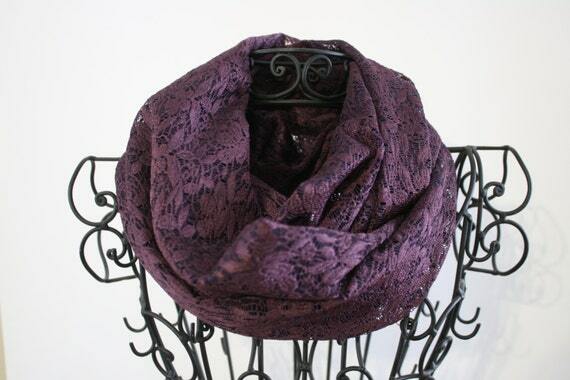 Little Luxuries has put a beautiful purple lace infinity scarf into the Mom & Baby Giveaway. I personally have one of Angela's infinity scarves (mustard, hand stamped with black arrows) and they are so lovely. Great attention to detail, you definitely get a high quality handmade item from Little Luxuries. If you love handmade accessories with a vintage, bohemian feel, you won't want to miss the new work from Little Luxuries. Disclaimer: A huge thank you to Little Luxuries for being one of the Mom and Baby Giveaway sponsors. I did not receive compensation for this post, and all opinions expressed are my own.